We've not communicated much ourselves (just once about an orchid: Spathoglottis) but I have long seen your posts in DG and enjoyed your joyful sharing of plant talk. I'm in India for a month. I flew into Mumbai, and am presently in Anjuna, Goa. My flight leaves Bengaluru Jan 15th or so. Would there be any chance we could meet for tea? I'd like to meet the famous Dinu. I have no solid plans but am thinking about Mangalore, Coorg, Mysore, and of course, Bengalore. Kenton J. Seth of Colorado US. So it was Mister Kenton. I could not let go of a chance to meet a fellow-gardener from the other side of the Earth. We exchanged E-Mails now. He kept me posted about his whereabouts and when the trip to Mysore closed in, I gave my phone number to enable him to call me from where he stayed. He did. It was on Sankranti Day [Pongal, 2010] and a holiday for work. So I went to pick him up from the hotel on Dhanvantri Road at the agreed time. We had not seen each other even in photos. He had told me his Room No. when he called. At the hotel's reception lounge, before I asked the man at the counter, I saw a lean chap curiously looking at visitors. His very look was enough to show that he was Kenton! Looking at him I inquired "Kenton?". "Dinu? ", he responded. A formal handshake, and we were off on my scooter. He had been waiting for me, ready. Since it was a festival holiday that morning, traffic was sparse. I wanted to show him a few places in the city as we went along to our house. I took him to my workplace since it was in a palatial building. 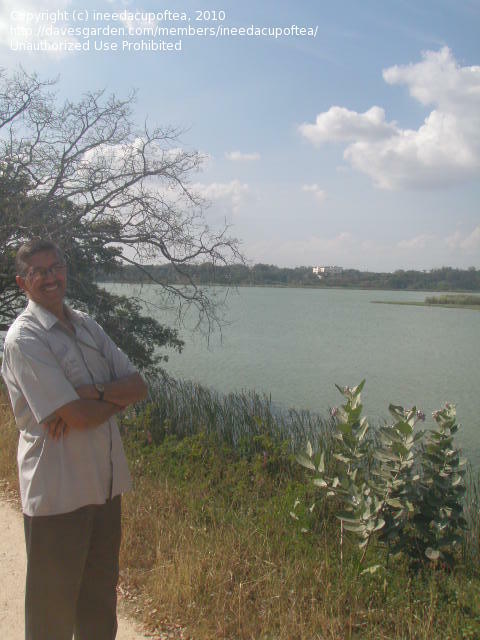 Then on the way, I took him to Kukkarahalli Lake, one of the few remaining water bodies of Mysore where he took my picture after I took his. I thought he would like the lake since he lived in a dry place in Colorado. Instead, he went after some wild grass that grew on the slopes of the lake bund, with great curiosity. He collected some seeds of it saying that he wants to spread the garden elsewhere! He said he had not seen such a grass variety, but identified the other variety and told its family name. So knowledgeable he was about plants. We sat there for a while and continued the ride. I showed him the old Maharaja's College, the Crowford Hall, etc. as we headed home. When we were near the District Offices, some climbing plant caught his eye. He wanted me to stop. Only real gardeners do such a thing! He got down and went close to it to inspect the leaf arrangement! This is my garden yard as Kenton saw that day. He looked very curiously at the Holmskioldia shrub that was in bloom at that time. .... and could not help taking a picture of it with his little Olympus camera which he loved for its simple features! After real flowers it was time to show my "digital flowers". Notice the red diary on his lap. He made notes of what he observed, lest he forgot. Plant names and what not. He must have been disappointed with the 'wildish' garden he saw. Kenton was curious to know if I had any favourite garden implements, like many gardeners do. I am no exception. He has clicked the button at the wrong time while showing the two implements! Don't get distracted with the shining whitish teeth there! ... on which I wanted him to write something for me. Our garden and plant discussions were not focused. It used to get diverted. In the excitement of meeting this special guest, I missed capturing photos of his other passion about tea-drinking. He wanted to drink tea and wanted to see how we prepared. So Kenton was taken into the kitchen for demonstration. He enjoyed watching it and later slowly sipping little amounts as our chat by then had deviated to Sankranti Festival. He was also served with the "Yellu-bella" [Sesame-jaggery]. It was lunch time. We have the old habit of squatting on the floor and have the meal, since we have no dining table, at least till date. Without practice others cannot do this. So the next best option for Kenton was to hold the plate with the left hand and eat with the right hand, sitting on a chair. When we gave the option of the spoon, he chose to have it with fingers, like we do. It was a funny sight to see poor Kenton trying to mix the vegetable sambar and cooked rice and then picking the morsel and inserting into his mouth with the fingers, without spillages! He wanted to try how it feels. He struggled. We had made him to wash his hands before food. He was one among us. He took a long time to finish his food. I really wonder now, how uneasy he might have felt, despite the freedom we offered. Once again, I did not record this event on camera. I was also having the meal. After a while, I left him back at his hotel. I met him that evening also. Since it was a holiday, the Mysore Palace was illuminated. Kenton was lucky to witness that also. I took him there. The next night, I went to meet him at his hotel and say good bye. 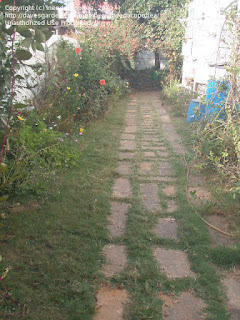 We had a long chat, walking the nearby streets, on various things other than gardening this time. I found he is an intelligent young man who is a keen observer and loves to travel the world to know a lot of things outside the plant-world also. I wanted to share with you the beautiful power of gardens, like 'Dave's Garden,' and moreover the internal common value of nurturing green things, to faciliate connexions. 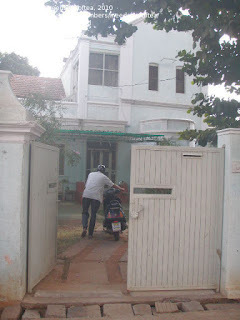 I recently returned from a trip through Southern India. An extraordinarily diverse place, it was a month of just about everything and anything that could happen. It may be easier to find worlds NOT to describe Soutern India, like "boring." 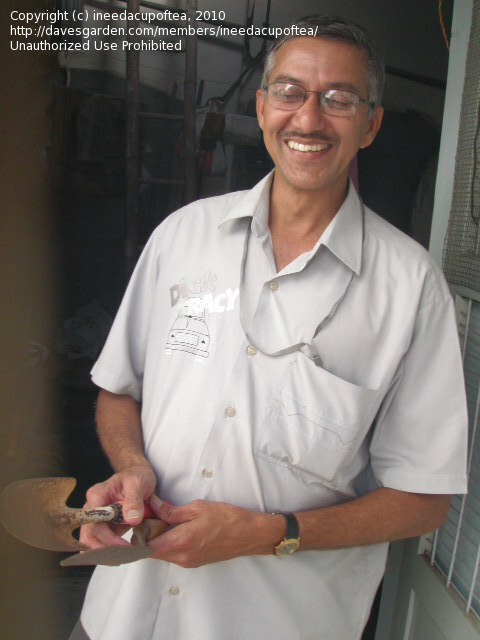 The gem of the trip was meeting a fellow Dave's Garden Member, Dinu. He and I had had a very brief correspondence regarding an orchid ID a year or so ago by e-mail. Upon realising I would be in Mysore, I was elated to have the chance to meet a fellow DGer, which I have done many times, but not on the exact other side of the Northen Hemisphere. He was able to share with me all sorts of fine details to enrich my understanding of the place tenfold. It was also incredibly nice to chat plants (you know, that plant nut thing we gardeners do) with a like soul. I was extremely fortunate that the day was a holiday, so Dinu had the day off and we could scoot around town. He showed me some fine places. Having 'ineedacupoftea' here was really a 'Kentonizing' experience! Thanks for sharing, Dinu - and thanks to Kenton, too, for sharing. What a wonderful thing, to be able to meet up, Dinu. It sounds like you showed him a grand time!!! Dinu, I just saw this and I'm so happy for both you and Kenton that you could meet. How wonderful and what fun must have been!